Capping off an undefeated four-game slate, Boulder City High School girls basketball team moved into first place in the 3A Sunrise standings after defeating rival Moapa Valley 44-27 on Tuesday, Jan. 29. (Robert Vendettoli/Boulder City Review) Junior guard Madison Manns dribbles the ball up court when Boulder City High School faced rival Moapa Valley on Tuesday, Jan. 29, 2019. The girls won 44-27. A monumental victory for the program, the visiting Pirates were last season’s league champions and riding an 18-game winning streak against league opponents, dating back to 2017. Playing their best basketball of the season, the Lady Eagles dominated the Pirates throughout the game. Ahead 18-13 at halftime, the Lady Eagles turned it on in the second half to rout their highly touted rival. Howard, with 13, points led the effort along with Madison Manns, who scored 13 points. Coming a long way in four games since their league-opening loss to rival Virgin Valley, the Lady Eagles look like a team that has turned the corner and is playing up to its potential. 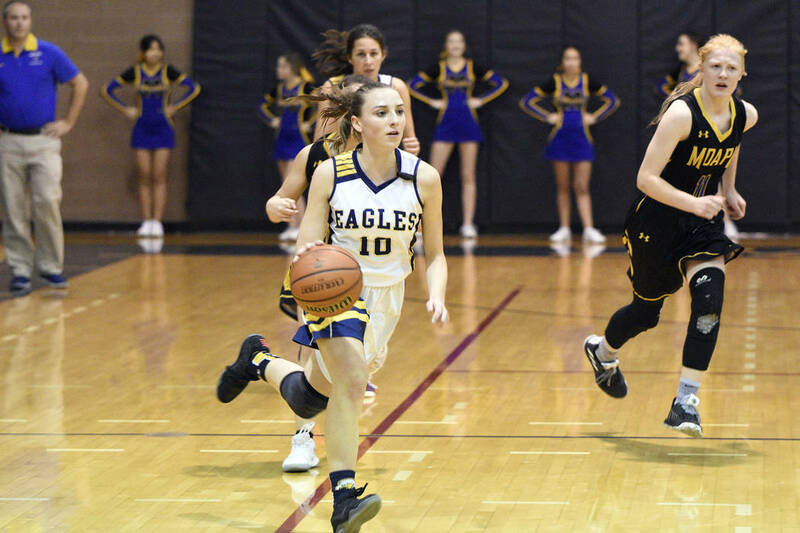 The Lady Eagles defeated league opponents Chaparral 68-36 on Jan. 23 and Sunrise Mountain 62-54 on Friday, Jan. 25, followed by a 40-28 victory over Eldorado on Monday, Jan. 28. The girls stepped it up with a different leading scorer every night. Howard scored 26 points with 19 rebounds against Sunrise Mountain; Setia Cox scored 18 points against Chaparral; and junior Keely Alexander led the way against Eldorado with 14 points. Against Chaparral, Alexander added 14 points and Howard scored 13 points. Cox added 14 points against Sunrise Mountain and Alexander added 11 points. Hoping to stay atop the 3A Sunrise standing, the Lady Eagles will host rival Virgin Valley on Friday, Feb. 1, before a road game at Somerset Academy Sky Pointe on Monday, Feb. 4, and a home game against Chaparral on Wednesday. Closing out the regular season with a victory, Boulder City High School’s wrestling team defeated Chaparral 54-30 on Jan. 23. Picking up pin falls on senior night was Ryan Vanario (220 pounds), Thorsten Balmer (182 pounds) and Hayden Moore (160 pounds). Unable to wrestle their last home match, seniors Mike Kaposta and Jimmy Dunagan earned victories by forfeit against the Cowboys. Featuring a solid junior core this year, the trio of Cade Cowley (170 pounds), Ladd Cox (152 pounds) and Curtis Brown (126 pounds) also picked up pin-fall victories. Cruising through the regular season with the goal of state in mind, the Eagles will begin their postseason journey Friday, Feb. 1, at Moapa Valley High School in the 3A Southern Region meet. Friday, Feb. 1, regional championship, Moapa Valley, 3 p.m.
Saturday, Feb. 2, regional championship, Moapa Valley, 10 a.m.
Feb. 8-9, state championship, at Winnemucca Event Center, 3 p.m.